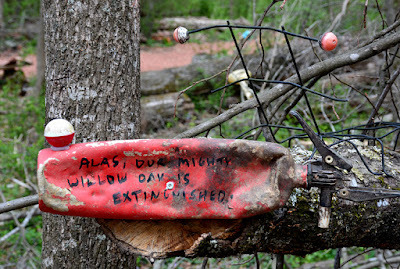 The Atlanta Preservation Center's program Phoenix Flies is a favorite of mine. I try to go on several of the more than 200 free tours over the course of the two weeks they're offered. I had such a busy winter that I didn't make a Phoenix Flies tour this year until the first day of spring, which was the last day Phoenix Flies tours were being offered, BUT it was a tour that I'd read about for years and one that I'd been wanting to go on...a tour of the Doll's Head Trail. The description of this tour said, "requires the ability to walk two miles over rough terrain." I found it invigorating! It's definitely good exercise and you want to wear walking/hiking shoes, but the two miles goes fast...I thought. The Doll's Head Trail is only a portion of the path that wraps all the around Constitution Lakes, a Dekalb County Park. Some of the total pathways are brand new boardwalks and some of it raw path, with boardwalk construction in-progress. This particular display, pictured above, was one of the images on the cover of the brochure for this year's Phoenix Flies program. 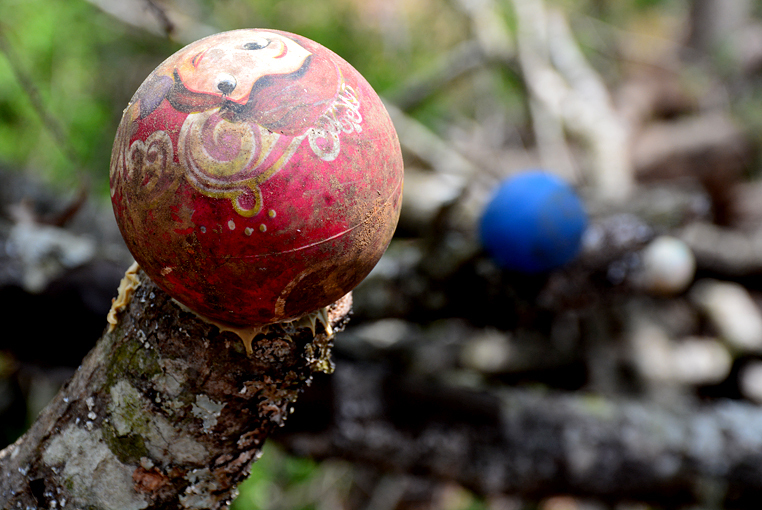 I'd see the image for years, but it was still pretty cool to see the real thing. The computer geek in me (my college degree is in technology) was trying to figure out what the framing device once was. It looks like a portable television with a floppy disc reader of some sort. Who among my readers remember using floppy discs and did you learn not to leave them on the dashboard of your car the hard way? 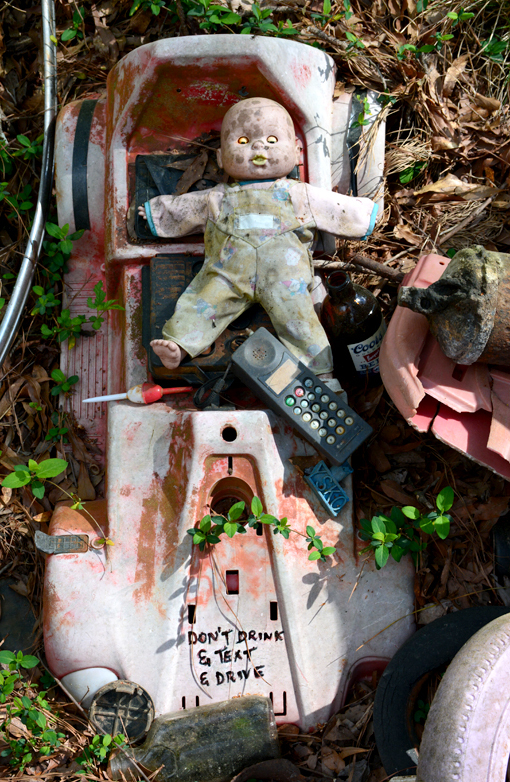 This Doll's Head Trail tour was led by its creator, Joel Slaton. He shared with the group that one of his inspirations when creating the neo-folk artwork filled destination was none other than longtime Georgia resident and artist Howard Finster. If you've been to Howard Finster's Paradise Garden, you'll totally get the correlation, but if you've not been to Paradise Garden, you're totally missing out on a mesmerizing experience! One of the first two attributes you'll notice about the park is bright red mud—and lots of it—and approximately a bazillion bricks! The Doll's Head Trail is the former site of long-defunct South River Brick Company. 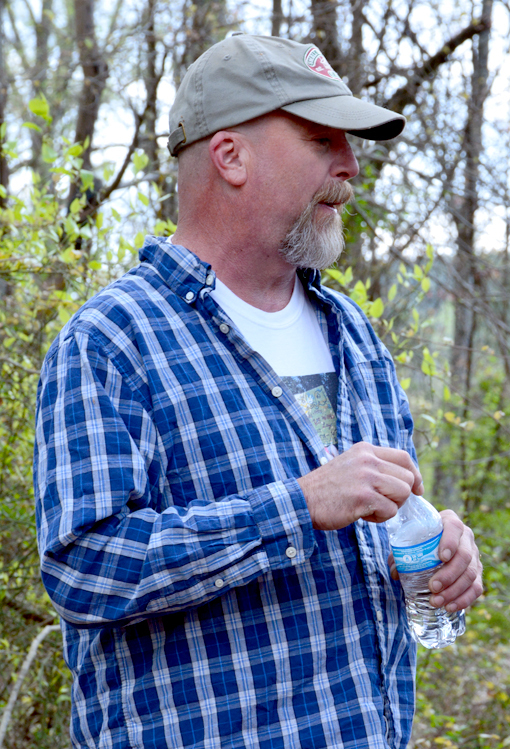 Joel calls what he's doing a Restoration Park. It's a noble cause and a great gain for Atlanta. 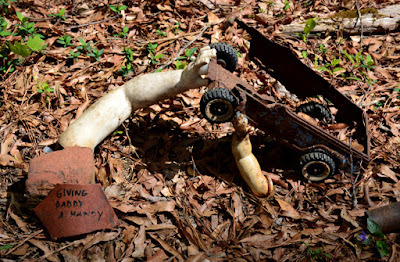 History Atlanta offers an in-depth description and history of Doll's Head Trail. I encourage you to delve into what they've written...it's rich in history and quite fascinating! "DON'T DRINK & TEXT & DRIVE"...in that scenario there's never a happy ending. 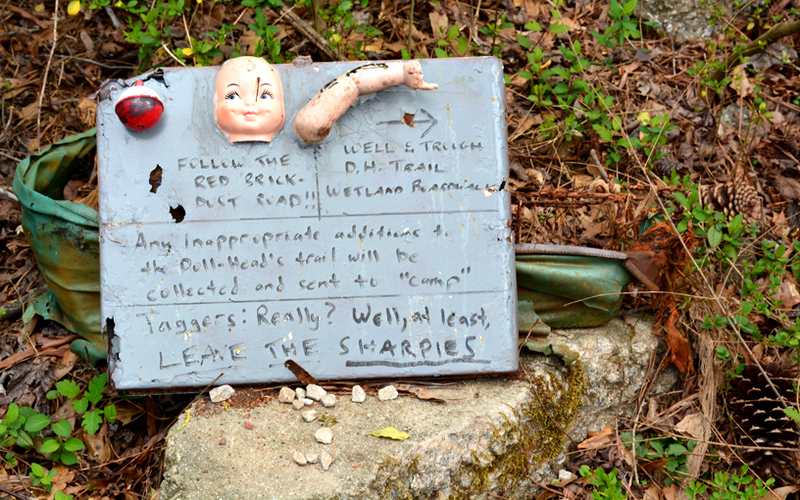 The Doll's Head Trail comes with some excellent advice and a few life lessons. Some of it is surprisingly jovial and clever, but on occasion it offers bits of wisdom that one might have a better life for heeding. In addition to a Smurf, you're going to see fishermen (Yes, you can fish here! ), lots of wildlife including some spectacular birds, plants you've probably never seen, and a beautiful, serene landscape that you'll hardly believe is inside Atlanta's I-285! You don't have to travel to Orlando or abroad to see a princess...there's at least one at the Doll's Head Trail, probably a few, in fact. There is indeed lots to take in! 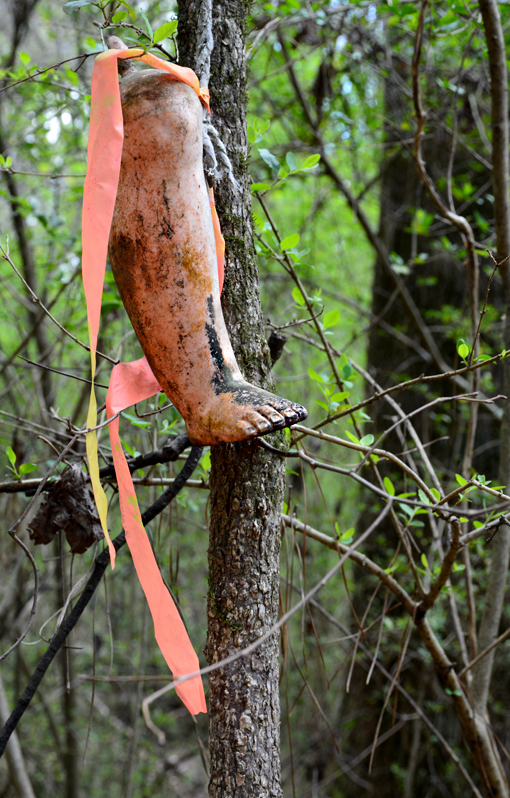 Joel pointed out one spot on the trail where he retrieved 75 doll's heads! Getting there might be a little tricky, unless you've done your homework before you leave the house. Looking at Google Maps, the address of S. River Industrial Blvd, SE, Atlanta, GA 30316, puts you at the entrance of the Trail. On my visit, I used GPS, which put me on the wrong side of S. River Industrial Blvd. If you're traveling South on Moreland Ave, SE, you will want to turn LEFT at S. River Industrial Blvd, SE, not the opposite direction that my GPS sent me. I hope this saves you a few minutes and a lot of frustration. My bad for not looking it up before I headed out. Just when you think you have a leg up on what's going on, you're going to see a totally unexpected sense of "clever"...you're going to see a lot of that, actually! I particularly found "The age-old question" and the "pet rock" delightfully funny. You'll see what I mean when you visit. 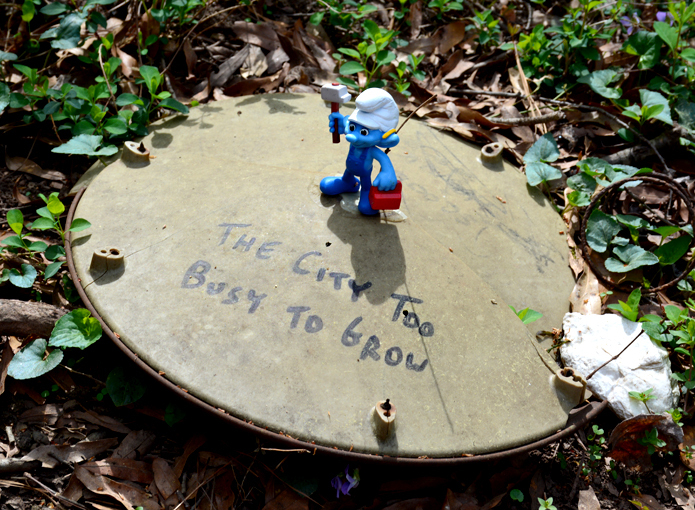 Remember the first photo in this post, where it was written: "Taggers: Really? Well, at least, LEAVE THE SHARPIES!" I'm not exactly sure what was being referring to, but the latter sounds like a sensible request to me. 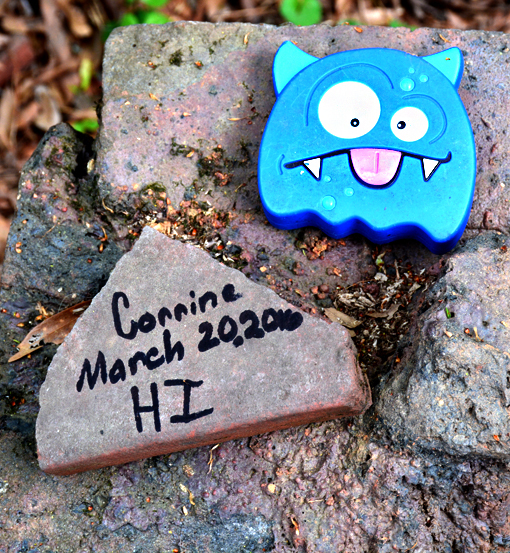 Slaton generously leaves Sharpies for visitors to write messages and drawings on pieces of terracotta tiles scattered throughout the Trail. The above was was left by a tagger named Corrine, a lovely youngster visiting with her family, who we saw had tagged something seemingly every few feet! You gotta love enthusiasm. I think Sharpie should contract Joel Slaton as a spokesperson! 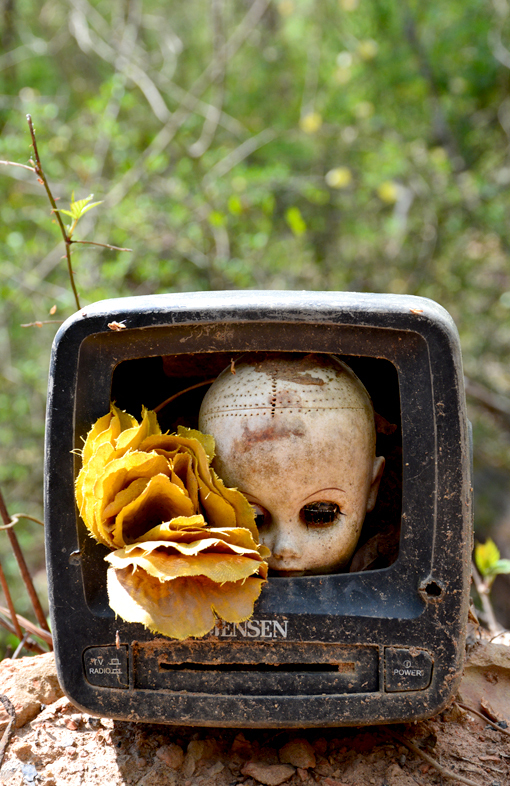 When you're looking for something quirky that's also filled with vibrant nature, check out the Doll's Head Trail. Thank you, Joel and Atlanta Preservation Center for adding this informative, insightful tour to this year's Phoenix Flies program!